Forex Fundamental Analysis - Find the best FOREX Brokers, FOREX Bonuses, FOREX Signals, FOREX News, FOREX Rates and everything FOREX related on Forex Directory! Forex Fundamental Analysis describes a type of market analysis that includes studying of the economic situation of countries to trade currencies more effectively. It can give you important information on how the big political and economical events affect the Forex market. Figures and statements that are given in speeches by important politicians and economists are relevant for a Forex trader as economical announcements which have a great influence on currency market moves. Especially announcements which are related to United States economy and politics should be in your main focus. E.g. if the forecast is better than the previous figure, then US dollar normally is going to strengthen against other currencies. If news are due, you should always check the actual data. Please visit our real-time Economic Calendar to have an overview over the actual economic events. How do you read the Economic Calendar? The impact factor recommends how much influence current economic data is expected to involve. 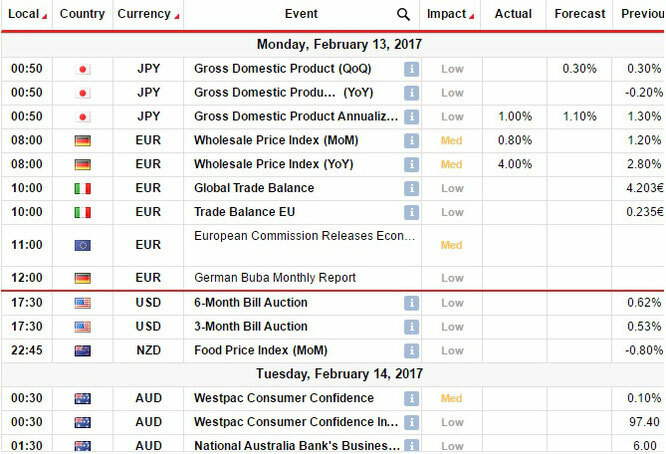 It is relevant to know the time of High impact data release when you trade an impacted currency pair. While an actual news release the market becomes volatile. The power of the volatility depends on the "factor of surprise" which is brought in the news. The "factor of surprise" can be determined as a level of unexpectedness, where Forex traders compare the Forecast data to actually published data. Medium impact economic data should also be taken notice in case of the factor of surprise turns to be high. Mostly low impact data do not change the Forex market significantly. The column "Previous" in the Economic Calendar offers data from the last release. The column "Forecast" shows the numbers which economists are forecasting and expecting for the upcoming release today. The column "Actual" is only updated after the data is published. If data becomes available it is immediately compared against Forecast values, and depending on overall positiveness or negativeness of the news for the currency plus allowing for the factor of surprise, the market price drops or increases within seconds. The economic News impact - increased market volatility - normalls continues for 1-3 minutes (highest volatility) and the next 5-10 minutes the market experiences corrective/adaptive volatility, where the market price settles all in all in a new shift of the market. Which speeches are interesting for you? Chairman of the Federal Reserve Bank of USA, Secretary of the Treasury, President of the Federal Reserve Bank of San Francisco etc. Speeches of those prominent people are watched narrowly by Forex traders. What are the most powerful figures that can move the Forex market? Conventionally when a country raises its interest rates, its currency will strengthen because investors will deflect their assets to that country to obtain higher returns. Declines in the payroll employment are assumed as signals of a weak economic activity which could lastly lead to lower interest rates that has a negative effect on the currency. A country which has a significant Trade Balance deficit will usually have a weak currency as there will be permanent commercial sellings of its currency. GDP is reported quarterly and is watched narrowly as it is a fundamental indicator of the strength of economic activity. A high GDP figure is generally followed by expectations of higher interest rates, that is most of the time positive for the currency. When news are published some Forex Brokers may not be supportive of Forex traders intensions to trade during these news announcements. Some Forex Brokers simply freeze their trading platforms while news with the result that no trades can be made. It is the prime real indicator of the strength of consumer expenditure. Rising Durable Goods Orders are usually related with stronger economic activity and can lead to higher short-term interest rates, that is normally supportive for a currency. How can you use these data for your trading? 1. You should have an Economic Calendar ready. Have a look for the events if data are due to be published. 2. You should always know which indicator is gaining the most of attention at any given time as it becomes a catalyst for future market price moves. E.g. when the U.S. dollar is weak Forex traders will watch narrowly the inflation indicator. 3. If the difference between the expectations and real results appear, you should pay attention to corrections in the market price moves. 4. You should watch out for news revisions if there are any, the situation on the Forex market can change rapidly. Based on the high volume of trades which are made at the time of important economic announcements some Forex brokers can block or slow down the execution of new trades. For Forex traders it implies that they have to enter a trade before the "major action" starts and more importantly, they must always have their protective stops placed. When you are not able to access your trading platform to close the losing trades timely this is the most frustrating moment which Forex traders should always try to prevent.